Got my call yesterday, called back today. Fairbanks Mazda. They are collecting cars and ordering parts. They added my 6 to the order (not called on it yet). They go in through the glove box to replace the unit. They do not replace the cover. The cover is still a $1400 part because "it attaches to a lot of stuff". Is it just the passenger side on the affected 8s? The gory pictures that NBC news showed the other evening were driver side bags. Not RX-8s, though. FWIW, I got onto the NHTSA VIN lookup site during one of the brief periods that it was up. It just forwards you to the various car makers sites. Apparently no actual VIN database at NHTSA. The flaws were in a set of airbags, those air bags may have been installed in different locations dependant on car manufacturer designs. For the RX-8, a different air bag went into the driver's side. Again, it's a narrow lot of air bags, not every air bag from the manufacturer, or even every air bag of the same design from the manufacturer. Just 1 lot of air bags from 1 manufacturer. They just can't figure out where all that lot went. Just talked to Continental Mazda in Anchorage Ak and they have already set me up a time to drop the car off and have the airbag replaced. I had no idea about the recall until my carfax app chimed this morning about the recall. I was just reading about the air bag recall that has been in the news lately and I seen that it also includes the 2004 - 2008 RX8's. I wonder if they will also replace the cracked dash covers on the passenger side of our cars. Mine is cracked pretty bad and I've been contemplating replacing it. But now maybe I can get the dealer to replace it for free. Does anybody else have any information of this? I think I'm going to take my car down to the dealer tomorrow morning and see what they have to say about it. I agree don't panic, but also don't sit back and assume because it is a small likelyhood you have a bad bag to just sit and do nothing. Just like KpaBap says it is ridiculous that Mazda wouldnt change the airbag (within the affected vin range) just because the car was SOLD in a lower humidity region. That is just putting saving dollars ahead of saving lives ! Classic auto industry and government policy. Affected RX8 owners have to stand up and demand this fix, that is what I am saying. I have been a Journalist who crusades for consumers for all my career, I won't change now. Last edited by gwilliams6; 10-25-2014 at 12:13 PM. I never understood why putting an explosive device in dashboards was considered to be a good idea for safety. Especially when the primary justification - that you wouldn't need a seat belt - turned out to be utter bull. Air bags have killed in the past, and doubtless they'll kill in the future. But there's no reason to accept ones that can hurl shrapnel. People had similar complaints and concerns about transporting a dozen or more gallons of a highly combustible liquid around in a vehicle with electricity and hot parts. Yes, faulty air bag chemical mixtures is a problem, and one that shouldn't happen. The fact that this recall exists is proof that people and companies do not accept fault mixtures. Ken, your point would be well made if this issue was being ignored, but it isn't. The fact that the air bag maker and all the car manufacturers that might have gotten one or more of the faulty air bags are recalling the at risk calls exactly defines that no one is accepting it. Note, I'm not arguing that this should be ignored, swept under the rug, etc... I am just advocating taking it in it's proper perspective, and addressing it calmly. Letting the mass media guide your thoughts and emotions contrary to calm reasoning is to willingly let them control you, and no one should permit that. gwilliams, I'm not sure what you feel you have to advocate. The mass media has it all over the place. Just scroll back through the thread to see how many people are creating other threads about the recall. I ended up making an annoucement just to cut down on the administrative irritation of no one bothering to search about it yet. The news is certainly out there. Your point is one that is founded on a flawed premise. You are seeing "all air bags". But that's not true. For example, the RX-8's driver's side air bag isn't even of the same design that the flawed air bag chemicals ended up in, so complaining about the driver's side air bag would be pointless. The same with vin ranges. Mazda picked the vin range that they did for a reason, and Mazda's past history about safety recalls has been EXCEEDINGLY cautious about making sure they cover everything that they need to. Back in 2006, one jackamole reved a Mazda5 while parked for an extended period of time, and the exhaust heat started a fire under the rear bumper. Mazda shut down sales of the 5 for a period of time until they could devise a safety feature to prevent someone from doing that. Just an example. I'm talking about at the corporate level here. The above shown email from a dealer doesn't mean much to me, because we all have daily proof from new members about how asinine and ignorant dealers can be. It is why I recommend contacting MNAO first, instead of a dealer. But again, Mazda picked the vin range for a reason. Have you considered that there may have been a part change after that vin range? or perhaps they know for sure that after that vin range the air bags were not in the possible fault lot? etc... Saying that "another RX-8 of the same year had air bag trouble" isn't even really valuable, because there are certainly other reasons for air bag problems out there, and crashes in which people are injured with perfectly good air bags. Trying to automatically link the two without any sort of real evidence is just as harmful as ignoring the possibility of a problem. Yes, I agree that "heat and humidity" should have quantitative definitions. Everyone thinks they deal with hot and humid, but it is all relative. There are VERY FEW places in the US that see anywhere near the kind of heat + humidity that PR, HI, and FL see. In fact, that's the reason for that list. And I am sure the reason those were chosen is because of sustained heat and humidity, not peak. 10 years of 100% humidity and 60F-110F is hugely different on a chemical/material level than 6 years of variable 30-100% humidity and -10F to 90F. Sure, the pictures the media uses are gory and shocking to look at, but considering how badly the media mishandles any other topic, it wouldn't surprise me one bit if the images used aren't even from a faulty air bag crash. "Truth in journalism" is something you should be very aware of given your stated career, and you should also be aware of how little that is actually true any more. So go ahead and advocate, but put some of your own journalistic investigation into it and fully explore the entire topic rather than just shooting from the hip blindly. Last edited by RIWWP; 10-25-2014 at 04:07 PM. From what I read... all RX-8's are effected by the recall, not just Florida. RIWWP I never just shoot from the hip, and as far as Mazdas history of doing the right thing, I have been driving Mazdas for 43 years and know their history from the seat of my pants, better than you my friend. The parts of Mazda's history that you have maybe read and studied about, I have lived and participated in this history. Your seeming focus on me is a waste of this forum's and thread's time. The issue is accessing the risk and taking positive action, not whether I have, in your opinion. "fully" explored the entire topic. For all your knowledge, great moderator, I don't feel you have "fully" explored the entire topic, and you seem a little touchy here yourself, especially sometimes if we don't all fall in line with your views on the subject . I am just offering my advice here based on my personal experiences as a journalist and as a driver and dedicated enthusiast. And yes as an award-winning journalist of over 35 years , that has actually done due diligence and research in the past in cases of automotive recalls and the results of insufficient responses, I do have a leg to stand on here and something to say that comes from actual experiences and actual history. No one has to take my advice or agree with me, but don't try to silence anyone please, when they have something of value to add. I am not advocating panic, and I am not panicking myself. So stop your panicking over this ! Last edited by gwilliams6; 10-25-2014 at 11:15 PM. I'm not touchy. I just will always take a position contrary to one that is unreasonable, because it is perception that I disagree with, not what is being perceived. Since we both agree that people should contact MNAO with their VIN if they are concerned, I guess we have to agree to disagree for everything else on this topic. I'm not out to get you or anything. I just think that when I see someone saying "what? NJ is just as hot and humid as puerto rico! ", I think that it is unreasonable, and I have trouble supporting that statement, or anything based on that statement. For example. See now you show your lack of correctness here RIWWP, I am sorry to say. Because I NEVER said NJ is just as hot and humid as Puerto Rico. Show the forum where I said that, I did not.Check your facts! (Oh and while you are checking your facts, did you know that Honda and Toyota are extending their airbag recall to some states beyond the initial call for Fla, PR, and Hawaii cars). I wonder why they think other less humid states' cars could be at risk ? I personally don't know why, but an interesting fact. I am an experienced journalist and I am very careful and exact with the words I choose to use. I only reasoned that people who might drive a lot into humid areas or had a car that was moved into humid areas after being sold might also be at risk. I had this same conversation with the Service Manager , Service Adviser and Chief Mechanic at my dealership and they thought this argument was reasonable. I am sorry you do not think it is so. Please don't misquote me ever, even if you are a moderator. Thank you. Some factual discoveries of non-high humidity states cases, and statements below for you RIWWP. Believe them or not. CBS News " has discovered complaints of airbags exploding in multiple states outside the recall zone, including Indiana, Ohio, Illinois, and Maryland." "Almost any area of the country may have high heat and humidity for an extended period of time, including the Northeast. The lines they've drawn are completely senseless and arbitrary,"US Senator Blumenthal said in an interview. "It would be laughable except it's deadly serious in its consequences." The senators' letter also notes that people drive their cars from the Northeast to spend weeks or months in higher-humidity southern states." "Regulators had allowed a recall limited to areas of the country with "high humidity," but some lawmakers are now calling for an immediate nationwide recall of millions of potentially faulty airbags. "There needs to be a real overhaul of the National Highway Transit Safety agency," said Sen. Richard Blumenthal, D-Conn., one of the lawmakers who has criticized the limited recall. "These exploding airbags can be killers," he said. "They literally have killed people." Blumenthal said drivers should be given loaner cars to drive while the airbags are being replaced, to make it as easy as possible for people to get the work done. "Disabling the airbags puts them in even greater danger so the only solution here is for a national recall with loaners provided to car owners at no cost to them," the senator said. " Last edited by gwilliams6; 10-26-2014 at 03:34 PM. Ken, your point would be well made if this issue was being ignored, but it isn't. 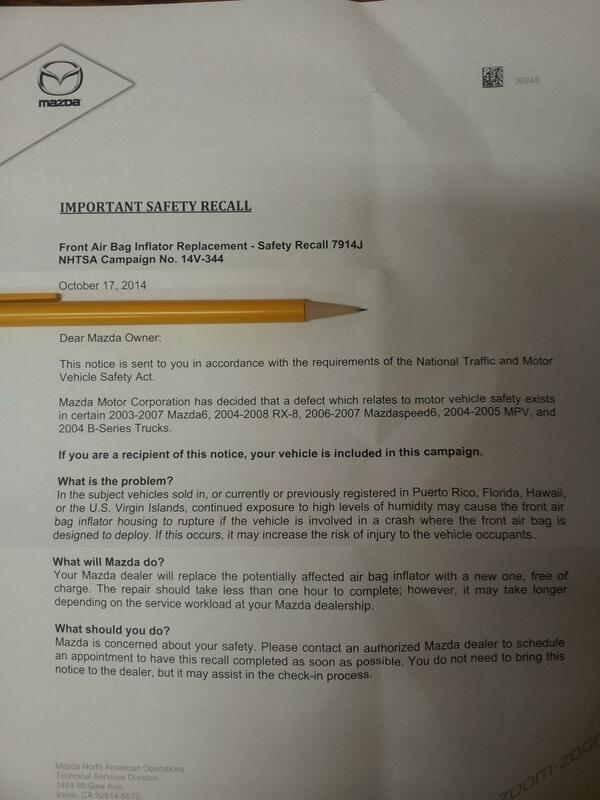 My point isn't so much about this recall as much as it's about how air bags were foisted on us in the first place. They were billed as passive restraints, no need for seat belts in an era when most people were too stupid to buckle up. The air bag crowd first tried selling their devices to the aviation industry. The aviation people and the FAA, having expertise, booted them before they could even get a toehold. So they descended on the auto industry, which was reeling from Ralph Nader's yellow journalism. I remember screaming at my TV when Nader would be on talk shows, talking about air bags inflating with nitrogen without ever menioning that the nitrogen was generated by an eplosive brew. I remember Joan Claybrook appearing on talk shows, and the only questions they took from the audience were from Clarence Ditlow, who was never identified as being her stooge. I remember the "out of position occupant" issue, when children and short people were being killed by air bags. I think the current recall will wind up being extended to everywhere. With a shortage of replacement detonators, it's prudent to give first priority to the higher risk areas. Kind of entertaining the way that the industry thinks they can limit it to just those areas. Til I get covered by the recall, I won't carry any friends in the passenge seat. Just people I don't like. Does Ralph Nader need a lift? 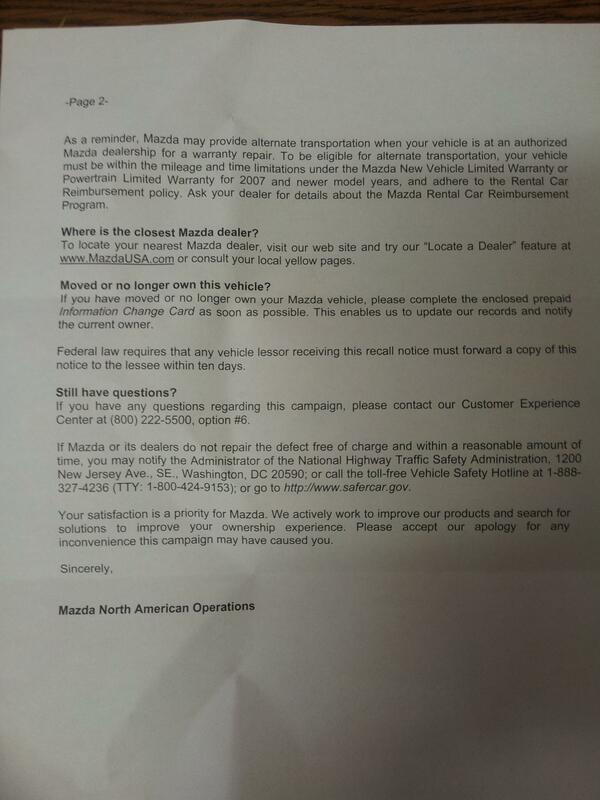 Ken this recall has already extended further, I live in Anchorage Alaska and after talking to the Mazda dealership here they have already agreed to replace mine. I just received my letter today also. A 2004 that has lived its entire life in midwest. Funny that no one mentioned car sales. Cars are sold and traded over state lines everyday. So, I sell my RX-8 today to someone who lives in Florida, it isn't qualified for a recall? What about Carmax? They are in the business of selling cars over state lines. So who's fault is it when Car Max sell an out of state car to a Floridian and a passenger gets injured or killed? Got the recall letter today too. Question is... my airbag light's been flashing for a while... Wonder if they are gonna deny service because of that. Doubt it. This isn't a Mazda recall, it's a NTSA recall, they have no choice. I spoke to the dealer by me and told them my car was heavily modified and they said it didn't matter. So they have to at least swap the bag out. The big question I have, and will find the answer to on Tuesday, is if the dash cap is being replaced, since the bag is riveted to it. I am really hopping so, since it looks like crap. I will let everyone know after the work is done. Bad news. From what they told me, the work is through the glove box, no new dash cap. I will know more after Wednesday. Had my airbag serviced under the recall on Wednesday. Took a whole 35 minutes after arriving at the dealer. Easy peasy.